It’s open house time again! Many of Atlanta’s private school’s admissions processes are in full swing and there is a busy schedule of open houses, information sessions, and other opportunities to visit the campuses and get to know the schools. I’ve listed the upcoming open house dates here but have linked to the school’s schedule pages for many more details on their admissions timeline. In last year’s post, I wrote about how competitive the process can be and how important it is to jump into the school’s timelines in order to secure a spot in your top choice. Getting into the open houses will give you a lot of insight into the school’s culture and really help determine your priorities when it comes to applications and admissions. For links to Atlanta private school home pages, check out this post. Every year, I have out of town clients that tell me which private school their child is planning to attend. Most parents aren’t aware of the process, the schedule, and how competitive it is. I have a post about “off cycle” admissions but most private schools in Atlanta don’t accommodate off cycle admission, creating a challenge for executives who are relocated during the summer months. Holy Innocents is the only one I know of that my clients have been able to get into off cycle. Part of being a realtor is helping families with relocation and transition and a big part of that process is finding the right schools for your children. I’ve done a few posts with tips and information about the process of application for Atlanta private schools in order to help parents navigate the process and minimize disappointment when unexpected things pop up. For me, it’s not just about selling real estate, it’s about helping people create homes here in Vinings and Buckhead! The “on cycle” process typically starts in October the year prior to the year you want your child to start, usually with testing beginning in October. Then in November the private school Open Houses start and the schools may schedule private tours of the schools as well. By January, schools have booked the individual interviews and they stop accepting applications in January to early February. Decisions are made and announced at the same time, usually the first Saturday in April. There are wait lists and a lot of movement during those first two weeks after announcements, so don’t give up on your first choice too soon. But it’s interesting because schools are pretty good at knowing which students are the best fit for their curriculum and education styles so I’d prefer a school that wanted my child on their first list personally. Trust the process and apply to at least three. Schools are looking for candidates that are going to succeed in their environment so it is not usually the parent’s choice at the end of the day, it’s up to the schools. It’s that time of year again- no, not pumpkin spice latte season, private school application season! Atlanta’s premier private schools are holding open houses beginning this month. Attending a school’s open house is a great way to get a feel for which school will be the best fit for your child’s education. Placement can be competitive, so it’s a good idea to get those applications in shape and in to Admissions as soon as possible. Here’s a tip: since 6th grade is the more common expansion year into middle school, applying to schools for the 5th grade year can increase your odds of acceptance and allow your child to settle into a new environment before the transition into middle school and doubled class sizes that begin in 6th grade. Whitefield Academy has a number of open house dates throughout the coming months; you can see which time best fits your schedule at their calendar here. You can also find helpful links to the school’s main websites on my Private Schools tab. Every year it is with sadness and happiness that I send my little boy back to school. This year, along with the usual preparations, we received a long note with a list of acceptable “nut aware” snacks. 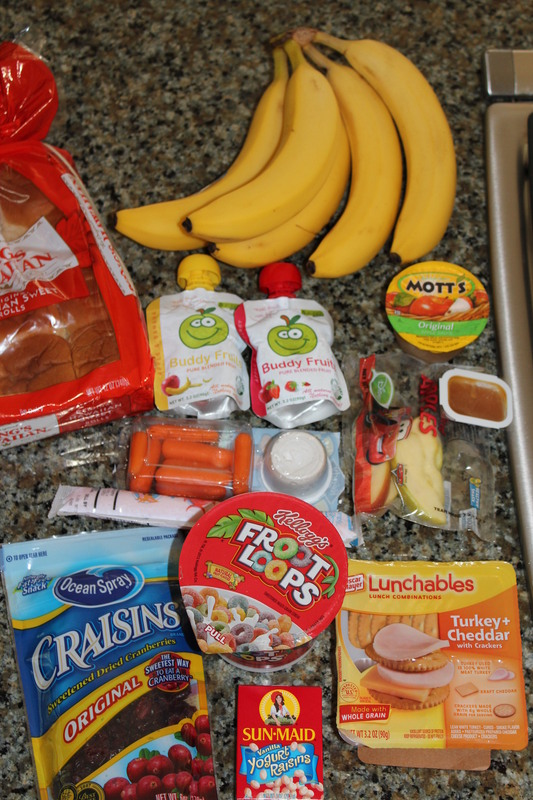 Last year it was cleared that we didn’t have any nut allergies in the room and I was able to send my child to school with healthy snacks that included peanut butter and granola bars. Those are now banned. As a working mom, it’s hard enough to plan meals for breakfast and dinner every day without worrying about daily snacks as well. I’ve discovered a few things that qualify in the healthy category, and are nut free, so I wanted to share them with those of you that may be struggling with this on a daily basis too. I’m glad to share any ideas that come in comments as well. I found these neoprene bags that I can put a cooler pack in to keep these things cool until snack time. 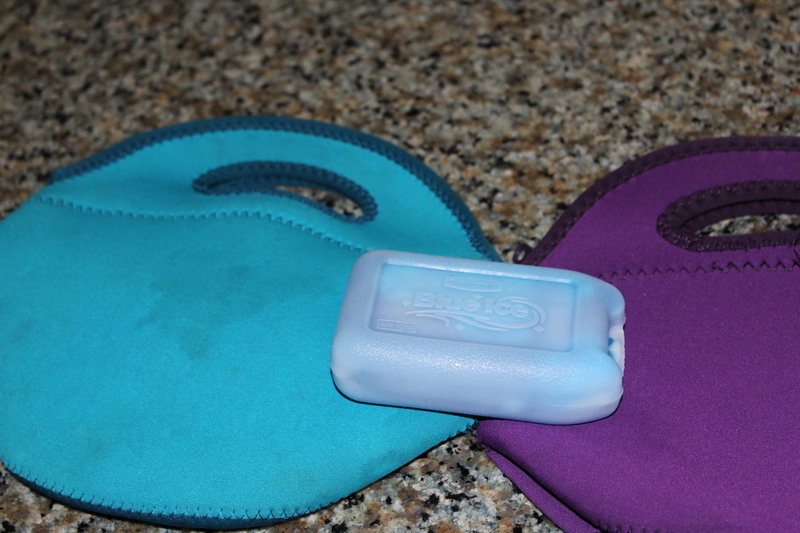 They can be washed and reused, which is handy if something gets smushed in transit. First: I found these bags that I can put a cooler pack in to keep these things cool til snack time. They can be washed as well which is good if something gets smushed in transit. – Fruit Buddies – these are basically an apple sauce consistency and come in a variety of flavors and have no sugar added. They are around $1 a piece but do come on sale as a Buy one, Get one type of thing occasionally and I stock up at that point. These don’t need to be refrigerated, but I do store them in my refrigerator and send them to school chilled as well. – Individual carrot/ranch packets – Last year I’d send a baggie of carrots & a little plastic container of ranch dressing and inevitably it would open up and make a mess in the snack bag, so these pre-packaged containers make morning packing so much easier and its still healthy! – Apples and caramel – I can send apples and they may get eaten, but I’m assured every single one will be eaten if I send in the additional caramel packet. These come 5 to a container and are fresh apples so you need to use them relatively quickly. – I do send in plastic containers of grapes and cheese cut up, but again this is a little more work. They have these pre-packaged with apples but they seem expensive to me, so this one I still do myself. – Gogurts – I’ve heard teachers don’t like these because they think they are messy, but I freeze them and if they go in the snack bag with the ice thing they stay pretty solid until snack time. – Dannon Drinkable Smoothie Yogurt – Again, I think teachers think these are messy as the foil on top can open up. I will send these occasionally in a lunch bag that has a plastic compartment that will protect it from being crushed. – Cheese – Babybel is easy and doesn’t seem to go bad. String Cheese is a little more fun for the kids. -Boiled eggs – I peel them in advance and as much as I personally don’t like them, my son does. They pack easy and make a great snack. – Turkey – Since I can’t send protein in the form of peanut butter I’ve been finding ways to send turkey. I use Boars Head turkey breast and put a slice in a little hawaiian bread roll. The sweet bread with the turkey is something he really likes and it holds him over well until lunch time. Or for after school, it will tide him over til dinner time. -Hummus is another option and I wish my child liked it more, but its never worked for us. -Lunchables have a meat/cheese/cracker snack option. I do keep a stash of the full lunchables as well so when we have playdates kids can pick what they want for lunch. Seems to go over well. – There are plenty of pre-packaged cracker options, but most don’t really fall in the “healthy” category. I do keep these on hand for back ups. – Oatmeal to go – these are pre-packaged but good to have tucked away in his back pack for the after school hungers on the days he stays late. – Cereal to go cups – I found these round tubs of cereal that are great for keeping and don’t need to be refrigerated. – Raisins and Dried fruit – My child isn’t crazy about these, but I do slip them in occasionally. I keep yogurt covered raisins, regular raisins, dried strawberries and cranberries on hand. – Rice cakes – Same thing. He liked them a few years ago and I got quite a variety of them from cheese to cinnamon, but the novelty has worn off. – Whole Grain Triscuits are good to throw in with the fruit or cheese, but I haven’t found them in individual packages yet and they tend to get broken and can be hard to eat. I’m sure there are many more ideas and I know one Mom who insists her child only eats Cheez-its! I hope I’ve given you some new ideas and your child is enjoying being “Back to School”! The designated high school in Cobb County for the International Baccalaureate Program is located at Campbell High School in Smyrna. Click on the image to see a video about the Campbell High School IB program in Cobb County, Georgia. During fall semester, eighth grade students at each district middle school are provided information about all magnet programs. Due to limited space at each program, students are selected through a highly-competitive, rigorous application process. The Open House for all Cobb County students and families interested in the International Baccalaureate Diploma Program at CHS will be held on WEDNESDAY, November 16, 2011 at 7 p.m. in the Livingston Auditorium at Campbell High School in Smyrna. After a general assembly and information session, prospective students and their families will get a chance to hear from the IB faculty members, to meet parents of alumni and current students, and to talk to several IB students. If you have questions, Email us or call us at 678-842-6856. If you are unable to attend the Open House event, please contact the IB Coordinator, Dan Penick, to make alternate arrangements for a visit to the school. The school is very accomplished ad sending its graduates onto incredible higher education universities. Check out the list of CHS IB Graduates College Acceptances. There are many wonderful private schools in metro Atlanta. In fact, there are way too many to name on my blog….so I have selected a few private schools here that are both highly regarded and also in the Buckhead and Vinings areas. Here’s a map of the private schools I selected: Atlanta International School, The Galloway School, Heritage Preparatory School, Holy Innocents Episcopal School, Holy Spirit Preparatory School, The Lovett School, Pace Academy, The Schenck School, Trinity School, The Westminster School, and Whitefield Academy. 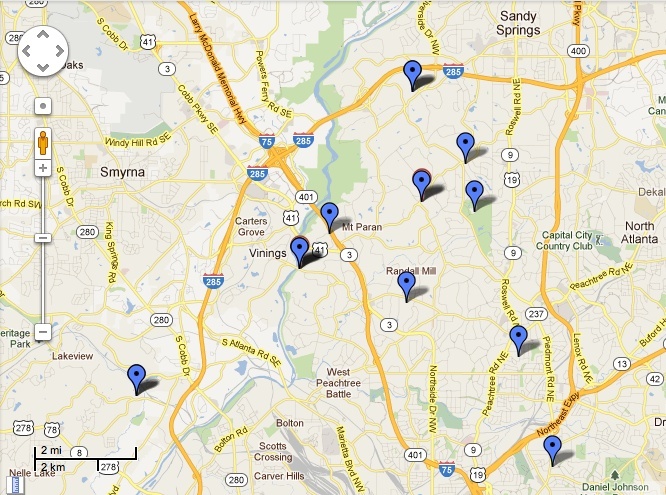 Click on this image to see an interactive map of the Buckhead/Vinings area private schools. What happened to the relocating family and their private school situation? Here’s an update on a previous post about off-cycle admissions to private schools. The family that I’m working with on their relocation to Atlanta was hopeful to get into the Atlanta private school of their choice. Well, the one they were focusing on thought they were doing them a favor and put the one child on a “wait list” and for the other child, they flat out didn’t have openings. The educational consultant that was recommended to me – Lida Greist of Griest & Williams Educational Consultants – turned out to be very helpful. My client had some contacts at Holy Innocents and Lida did as well. Happily, both children will be attending Holy Innocents’ Episcopal School in Sandy Springs in a few weeks. The moving trucks are arriving this week for their relocation to Atlanta and they’ll have a week to get settled before they start a whole new life here. I have found them a rental home here in Vinings until their house sells and then we’ll be searching their perfect home to buy in Atlanta. So glad it’s all working out for them. There's a possible second chance into the private school of your choice through a process known as "off-cycle" admissions. 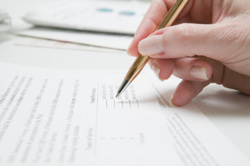 Well, we all know how stressful and difficult it is to go through the private school admissions process locally. The good news is when you’re local you know the schools, reputations and usually some people that go to the schools to help you along in the process. I’m currently working with a family who is relocating to Atlanta with two high school aged children that are in private school in their current city. I met them after they found about their relocation, but before it was public knowledge of the transfer. They had been talking to friends at a popular private school and decided that’s where they wanted to apply. They were assured by the school that they wouldn’t put them through the rigors of the application process, interviews and testing if the potential for a successful outcome didn’t exist. When I met the relocating family, I suggested they apply to a few other private schools in the Atlanta metro area to hedge their bets. Since they were from out of town, they wanted this particular school to know they were focused on them and decided not to do apply elsewhere. Well, yesterday the news came, one child was added to the school’s waiting list and the other child was declined. This news put the family into a tail spin. We had found a rental property and honed in on a purchase all around this school. Now they were back to ground zero. The term the family introduced to me as an option for them was new to me: “off-cycle” admissions. I called an admissions director and asked her how to handle this family. She was very helpful and suggested an educational consultant that has the contacts and understands this “off cycle” process. She said that she would help the family write up a bio to present to the schools, along with their test scores, etc. Here’s what happened! 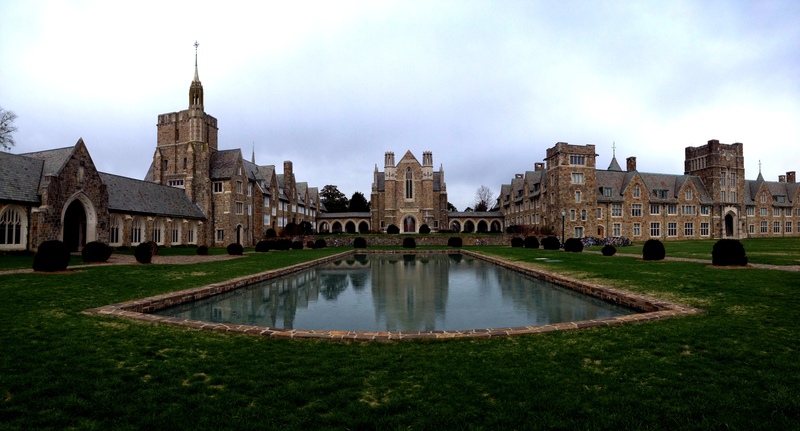 Check out this blog post on the Atlanta private school they selected. You are currently browsing the archives for the Atlanta Private Schools category.